Caron Swinscoe is a registered nurse who works with NHS Digital. She is the organisation’s most senior nurse and supports several programmes across the organisation with a focus on clinical governance, clinical effectiveness, clinical safety and user centred design. Caron has worked in the NHS since 1982 and has held a number of senior posts based in acute trusts and acute care. 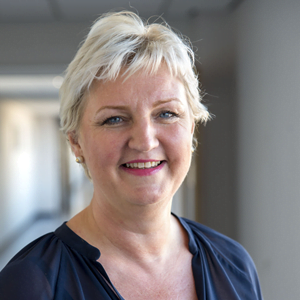 Prior to joining NHS Digital her role was Chief Nurse of Health Informatics and Head of Clinical Engagement at Nottingham University Hospitals NHS Trust. Caron believes that the narrative about the ‘digital future’ and the accompanying changes in healthcare has a tendency to focus on technology advances and work processes, however, at the centre of those processes is people, as they are the ones living and experiencing this new care environment. Caron’s goal is to ensure that the delivery of digital, data and technology in health and care and the associated ‘information revolution’ align with an understanding of the way nurses, midwives and wider clinical professionals prefer to work, identifying best practice which can be shared across the health and social care settings for the benefit of citizens, patients and staff.